Throughout the years Riding's ran a variety of trailers and tankers of all shapes and sizes. Below is a selection showing some of the various makes and sizes of trailers and tankers W & J Riding operated in their fleet dating from the 1920's through to the 1990's. 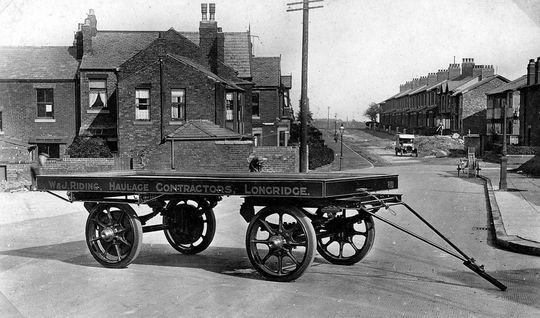 Pictured here in 1922, outside the premises of Atkinson Walker Wagons Ltd in Frenchwood Preston, is a brand new W & J Riding early design draw-bar trailer capable of four tons carrying capacity. Unfortunately soon after it was built the company of Atkinson Walker Wagons Ltd suffered closure due mainly to the depression at that time. Atkinson did restructure again a number of years later in 1933 but by this time Riding's were completely dedicated Leyland users and it was not until 1963 that they transferred their alliance back to the Preston company. 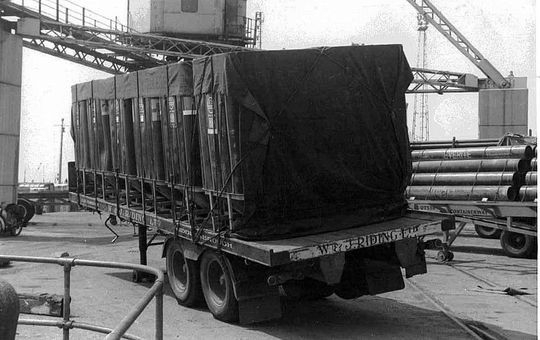 In this photograph we see one of Riding's original 26 foot Crane built trailing arm tandem axle trailers in a spot of bother on the quayside at Preston Docks. When the trailer was disembarking off the ferry, and the angle of the ships drop down ramp to the landing floor was beyond a certain angle, the suspension on the trailer could flick over as can be seen in this instance above. Loaded with 16 tons of Plas Bins the only way to put it right was the removal of one set of wheels and then flick the suspension back over. Another shot of one of Riding's original 26 foot Crane built trailing arm tandem axle trailers in a spot of bother on the quayside at Preston Docks after the suspension on the trailer had flicked over when disembarking the ferry. 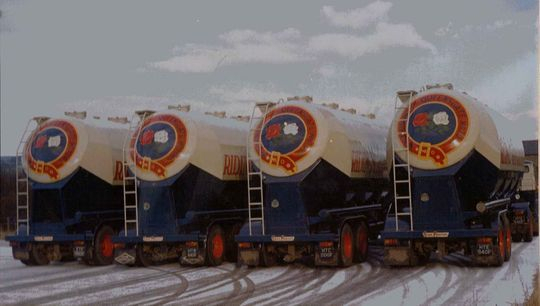 Four brand new Crane Fruehauf 1450 cubic foot tandem axle powder tankers introduced into the fleet in 1968. This picture shows the sign writers skill in abundance. All the detail you see was hand painted and was a credit to the dedicated craftsman the likes of which we rarely see applied to vehicles in this day and age. 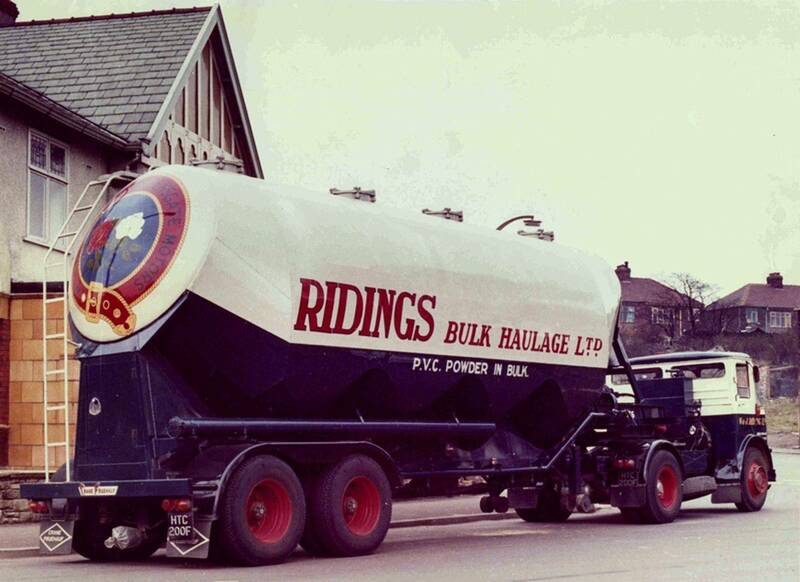 A brand new Crane-Fruehauf 1450 cubic foot tandem axle non tipping powder tanker which entered service with the company in 1968. All the detail you see on the tanker was hand painted in those days a far cry from the self adhesive graphics used today. 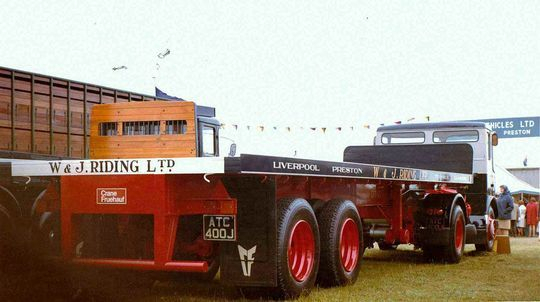 A brand new 30 foot tandem axle Crane Fruehauf trailer is pictured here on the Atkinson stand at the Royal Lancashire Show in 1970. Riding's ran quite a number of these trailers used mainly on the Wilton to Kilroot Irish ferry service. 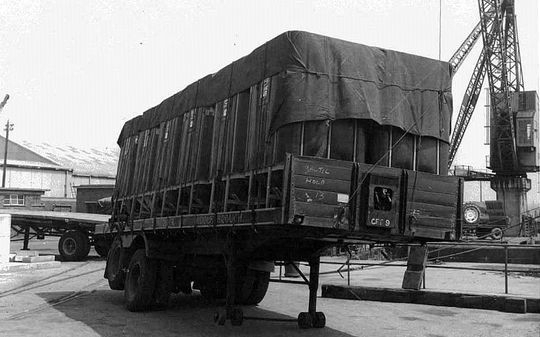 These particular trailers replaced the old 'four in line' trailers that had been used on the traffic before the gross vehicle weights were increased. One of a pair of specially built forty foot trailers supplied by Wheelbase Engineering to move cylinders of Phosgene Gas manufactured at ICI Ltd Burn Naze. 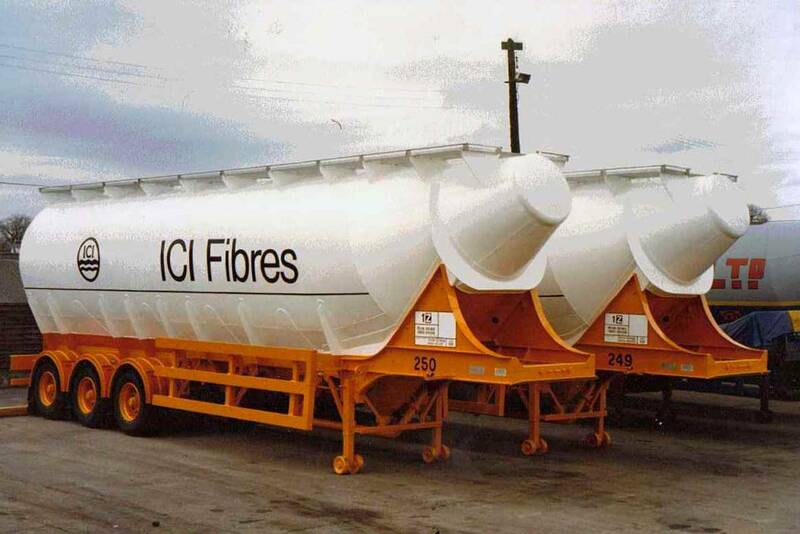 The cylinders were held by strong screwed clamps to the main chassis section of the trailer. 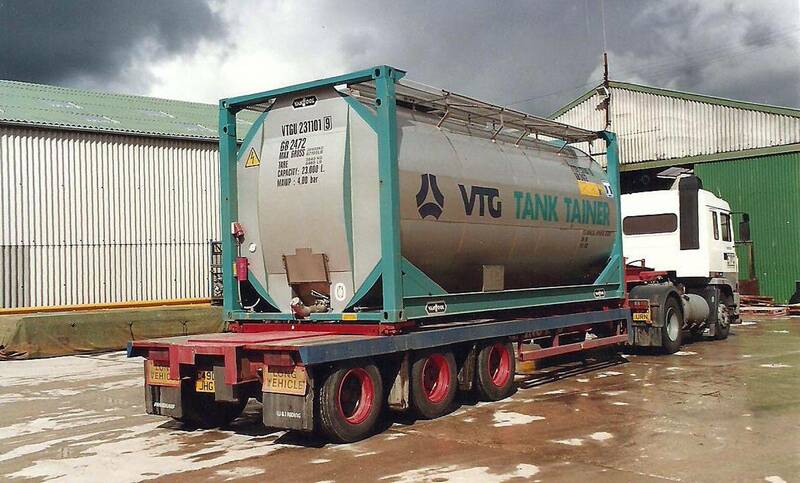 A pair of brand new Carmichael 2000 cubic ft non tipping tri-axle powder tanks pictured at Riding's Thornaby depot. 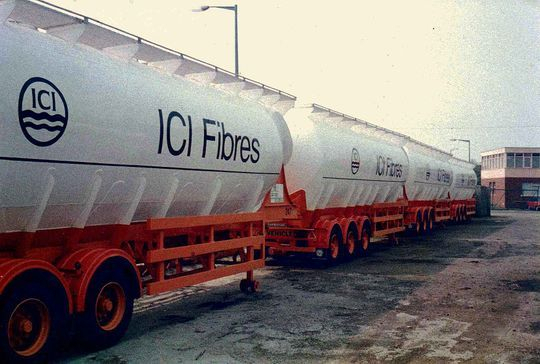 Altogether eight of these brand new tankers, all in ICI livery, were bought for this contract in 1984 which was quite an investment by Riding's. Four more out of a total of eight brand new Carmichael 2000 cubic foot non tipping tri-axle powder tankers, all in ICI livery, are seen here while awaiting the start of the movement of Nylon chip in 1984 from Wilton on Teesside to Pontypool in South Wales. This step frame skeletal trailer was one of pair built to order for Riding's by Municipal Trailers of Bamber Bridge. Originally when new in 1971 it came with a tandem axle but acquired it's third axle in 1983 when legislation increased the gross vehicle weight to 38 tons. 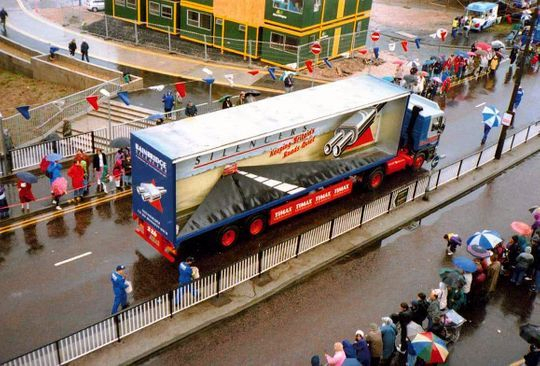 In 1992 forty foot curtain-sider trailer No 226 was taken off the road had it's curtains removed and was converted into a Timax Exhaust advertising float for the 1992 Preston Guild celebrations. 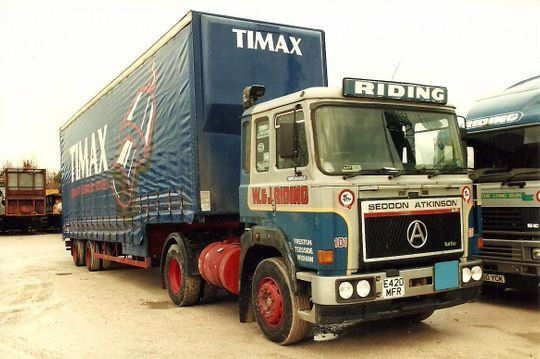 Seen here on the Preston inner ring road, opposite the Timax offices, the trailer is being hauled by Seddon Atkinson Strato 4x2 tractor unit Reg No G892 HFR Fleet No 84 aptly named 'Preston Guild'. The main stay of the tanker fleet were non tipping Crane Fruehauf tri-axle tankers which were put to a variety of uses. 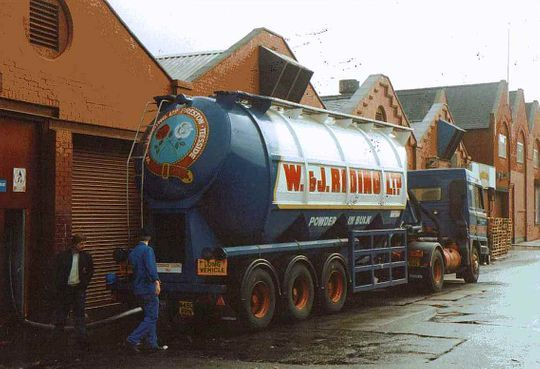 This particular one is seen here discharging a load of sugar at the Duerrs Jam factory on Prestage Street Old Trafford Manchester in 1994. A brand new Metalair-Fiilliat tri-axle 25 ton payload cement tanker pictured in the depot at Longridge. 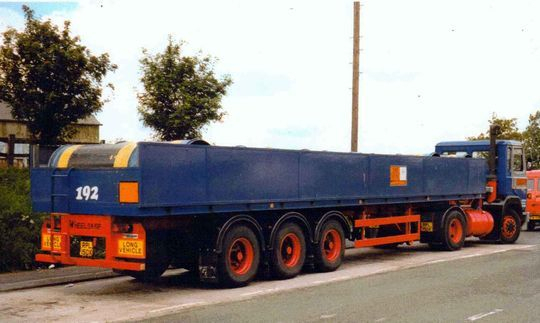 This was one of a number in the fleet which were used to transport cement from the nearby Castle Cement works at Clitheroe in Lancashire up to Coatbridge in Scotland. Riding's had quite a number of stepframe trailers in their fleet including this one which was rather unusual. "Occasionally Timax would have a problem collecting their own products from a site if the customer ceased trading or whatever. Their was a requirement for us to be able to carry a fork lift truck on a normal taut-liner to enable the driver to load himself if the need arose. 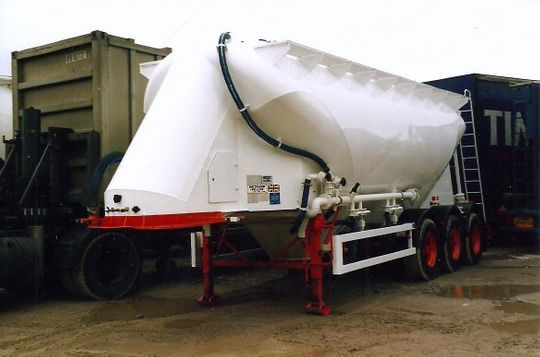 R.J. and I Wells modified this particular step frame trailer in such a way that a section of chassis was carved away immediately behind the fifth wheel step, suitably strengthened and pull out ramps fitted. This enabled a fork lift truck to climb on board and, providing the driver was suitably qualified, the system worked a treat.